Feeding Frenzy Over Brewer’s Brain Freeze: Arizona Governor Goes Silent! Aren’t you glad you’re not Jan Brewer? 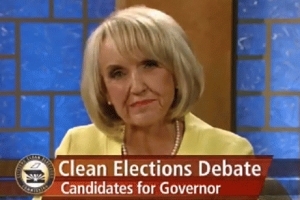 In ten fatal seconds during the opening remarks of a televised debate, the embattled Arizona governor secured a dubious kind of immortality for herself. Years from now, giggling teenagers and geriatric Baby Boomers will be able to view her cringe-inducing lapse of verbiage on the Internet and replay it ad nauseum for their amusement. In our own time, the governor’s detractors smelled blood and pounced immediately. And of course mockmeister-in-chief Jon Stewart had a field day. Gov. Brewer’s “meltdown” really wasn’t as horrifying as described, punctuated as it was by a self-deprecating giggle. She doesn’t pretend to be Einstein, after all. She’s human. Haven’t any of us ever gone blank under pressure? Couldn’t we just write off her sudden silence as a borderline-senior moment? At least she wasn’t reading from a teleprompter. Why all the fuss over a 65-year-old woman’s ten-second thinking gap? For one, we’re not used to seeing politicians run out of words; the novelty was startling. (I actually thought it was refreshing.) But I wonder if the sharks would have feasted so readily if, say, the governors of Nebraska or New Hampshire had muffed their opening statements in a televised debate. Probably not. After all, the governors of those states aren’t pivotal figures in the Great American Culture War. Gov. Brewer gained national notoriety for signing Arizona’s “illegal immigrant” bill, SB-1070, into law this past spring. Just in case you were unconscious at the time, the law allows Arizona police to check the immigration status of anyone stopped for other offenses: from speeding and loitering to drug trafficking and murder. To say that the law was unpopular with the left is like declaring that Babe Ruth could swing a bat. Opponents of the law assailed it as racist, nativist and un-American. The more agitated among them even called for a boycott of the entire state — baseball team, national parks and all. Then, in the supreme assault upon the governor (and upon logic itself), the federal government filed suit against Arizona — for attempting to enforce federal immigration policy. The bottom line is that Gov. Brewer became a lightning rod for liberal animosity. (After all, she flouted one of the left’s cardinal rules: never enforce the law against oppressed minorities.) And when you have so many agenda-driven individuals rooting for your downfall, they’ll seize whatever they can grab to discredit you. Racism always comes in handy. Stupidity is even better. Left-leaning partisans seem to relish those telltale moments that make their conservative opponents look uneducated, naive, foolish, semiliterate, clueless or just plain dumb. American liberals revere upper-tier formal education above all else, so they’re quick to deride their enemies for grammatical miscues (Gov. Brewer’s “We have did what was right”, for example), wayward neologisms (“misunderestimate,” anyone?) or a quirky relationship with the facts (e.g., Sarah Palin’s famous “You can see Russia from my house,” which in fact was Tina Fey’s line, not hers). For the left and near-left, any tangible proof of a conservative’s subpar brain wattage — even a fleeting gaffe that any of us could make in an unguarded moment — pumps their adrenaline and unites them in a triumphant tribal war-whoop of collective superiority. Despite their professed egalitarian underpinnings, leftists love to gloat over the intellectual deficiencies of people they don’t like. These days, that amounts to roughly three-quarters of the U.S. population. But don’t think for a moment that the left is alone in seizing opportune moments to demolish a foe. Conservatives can be sharks, too. They’ve been circling Obama since his presidential campaign, sniffing for traces of blood, moving in more boldly during his setbacks and gleefully ripping choice chunks of flesh. They won’t let the man accomplish anything… so they can lambaste him for not accomplishing anything. Accusations of socialism, Muslim sympathies, African birth, dithering, excessive vacationing — even treason — have been stalking this president since Day One of his administration. Anything to discredit him, nullify his prestige and render him powerless. During World War II, this kind of vicious two-way backbiting would have been unthinkable. Roosevelt had his foes, of course, but nearly all Americans had the good sense to unite behind him as he led us through the greatest military conflict in history. In the end our unity helped us prevail. What today’s partisans fail to grasp is that we’re engaged in an equally momentous struggle — against terrorism, economic disintegration, broken borders, cultural conflict, external enemies, internal rot and a host of other crises that have converged upon us all at once. In short, we’re battling for our survival against forces that would fragment us and bring us down. My advice: we need to stop attacking each other and start attacking our problems. Together. As a single nation. A diverse nation united by mutual respect and shared goals. E pluribus unum, remember? ← Do Moderates Need an Ideology? Benito: Thanks for the interesting background info on Gov. Brewer. I had heard about the “headless bodies” fabrication, but the other evidence you’ve provided points to a pattern of “truthlessness” in her behavior. Should her deficiences of character have any bearing on her fitness as governor? Perhaps so. Should we reject the Arizona immigration law because of her lies? No — we’re either for it or against it, regardless of how we view the person who signed it into law. My opinion is still that we have to control the illegal immigration problem, partly because we can’t excuse some infractions of the law (and not others) without appearing arbitrarily selective. Either we respect the law or we don’t. The immigration issue isn’t about race; it’s about whether the US should be obligated to offer free public services to vast numbers of people who illegally cross our border and don’t pay income tax. You have to agree that we can’t extend such benefits indefinitely or the country will go bankrupt. We have 307 million pepole by our last count. If we deport all illegal immigrants, the economy would not collapse because there would still be plenty of pepole in this country to take over the jobs. The only problem is that they need training for many of these jobs such as construction work, better pay, and better working conditions. Mexico should still be held responsbile for creating much of the immigrantion problem. With all the oil they have, they can use the revenues to start job creation.It is funny and ironic how police officers and many right wingers are oppose to each other viewpoints on immigrantion and gun controls considering the fact they both are conservatives. It is ironic cops stated that they need help from illegals immigrants to solve or report crime; however, they don’t seem to want that kind of help from the rest of the population whom they despise so much. It is also ironic cops favor gun control. I guess its easy for a cop who once did not want gun control until he/she joins the police force and then, he/she changes his/her mind when they get shot at or patting down a suspect, searching a car and/or house and finding firearms. A few shots will make you pro-favor control advocate pretty fast. This Jan Brewer what a piece o work. She’s going to ride this immigration rascit law deal as hard as she can, so she can stay governor. Meanwhile, there can be No Non-Racist way to apply this law. How is law enforcement to know who is legal/not-legal?Voters might think: oh, the Dems and Obama just want this country to be taken over by the %%^^!! illegals!! !For myself, I have never been able to get too worked up, as of yet, about illegal immigrants. First, this country allows them to work here legally, is my understanding, although it’s illegal to hire them (sort of like: you can smoke pot, but you can’t buy it or sell it).Such evasions of the law do not impress me.Second, what would happen to our economy if all the illegal immigrants were to suddenly and magically be wafted back to their home countries?How Dependent is the USA of these types of workers? Maybe very Much so. Well, if that’s the case, why blame the immigrants who come here, desperate for work?It’s Not their fault. They are just trying to survive, the same as anyone would do. I know I’d Hate to have to immigrate to a country that hated me, to work a horribly back-breaking, wearying ordeal of a job, only to face hostility, opposition, racism and, to boot, trying to get by in a country that speaks a language that I do not.So, obviously, people from places like Mexico and other countries and some May speak English, but I was using myself as an example, and I Don’t speak but one language Only come here out of dire circumstances.Type of America to try to use too much force at the wrong end, to contain illegal immigration.Why not stop hurting the chances of people in places like Mexico to earn a decent living?Ah, but that would be the Humane thing to do. Can’t have that!